For almost 130 years, the Missionary Benedictine Sisters have been “the hands and feet of Christ” serving the world’s sick, poor, young and old in isolated villages and impoverished pockets across the globe. 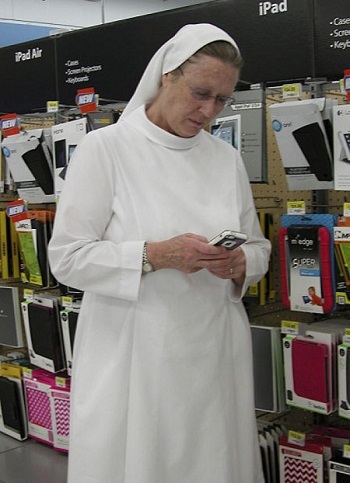 Now, in a new and challenging millennium, the Norfolk-based Roman Catholic nuns have expanded their mission to cyberspace -- reaching people with their messages of love, hope and faith via Facebook, Pinterest and Twitter -- thus earning the nickname the "tweeting nuns.” They even have an online chat. The Missionary Benedictine Sisters of Tutzing arrived in Nebraska in 1923, opening Immaculata Monastery, their U.S. headquarters, several years later. Twenty-eight sisters live at the monastery, and another five are stationed in Winnebago. Six American Missionary Benedictine Sisters are serving overseas in Kenya, India, Tanzania, Namibia and Italy. Using the Web, the sisters can now unite with those serving overseas and minister to a worldwide audience, said Sister Kevin Hermsen, development director at Immaculata Monastery and the prioress in Norfolk from 2001 to 2010. Earlier this year, the sisters launched a new website, mbsmissionaries.org, which features a media center providing updates and news from their work around the globe, including the recent dedication of the new Good Shepherd Orphanage Center in Mjimwema Parish in Songea, Tanzania. Sister Pia Portmann, now prioress of the Immaculata Monastery, returned to Tanzania for the ceremony. The center was her dream -- dating back to Sister Pia’s 27 years at St. Scholastica Priory in Peramiho, Tanzania, including 12 years as prioress. Sister Portmann, a Swiss native, came to Nebraska in 2010 to serve as monastery prioress. The Norfolk Priory’s redesigned website includes a devotional blog, other reading resources, a “virtual chapel” with meditative music, a view of the monastery altar, “virtual calendars” for offering prayer intentions and a live link for one-on-one chats. Their Twitter handle is @MBSnorfolk, and at last count they had 251 followers. Tweets feature daily devotional messages -- most penned by the sisters. Their Facebook page has garnered 1,547 “likes” since it started in December 2010. In addition to the daily devotionals, wall postings include news, links to the nuns’ blogs and other announcements. The Missionary Benedictine Sisters trace their roots to 1884, when Father Andreas Amrhein founded a new religious community. Over time, that communities divided into male and female branches. The first four women candidates joined in 1885. In 1904, the sisters moved into a new motherhouse in Tutzing, Germany. The headquarters of the congregation is in Rome. The Norfolk Priory opened in 1923, bringing nuns to the United States to serve German immigrants. The fundamental characteristic in the Benedictine way of life is seeking God in community. “Our common life finds expression in praying and working together, in sharing our goods, both material and spiritual, and in mutual service, support and encouragement,” the nuns wrote on their website. Today, the sisters in Norfolk represent nine nations, which offers them a constant reminder of the imperative of their international outreach, Sister Portmann said. “I already see our life in a multicultural community as a mission,” she said. “We need to be aware that we are not (on) an island. With the way the world is today, and the options we have for communion with the poor and needy, it should increase our (international) awareness,” Sister Portmann said.